Sgt. 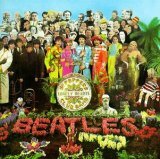 Pepper’s Lonely Hearts Club Band (released June 1, 1967) is an album of superlatives. It’s oft-described as the most influential pop album ever released, the first “concept” album, the album that launched FM radio, the best Beatles album of all, and the first by any artist anywhere/anytime to truly combine so many of music’s disparate elements – rock ‘n’ roll, pop, R&B, psychedelia, jazz, orchestra, Big Band, country, Eastern, and so much more. Hyperbole notwithstanding, I still won’t argue any of those descriptors. Yes, it was all of that, and more. But despite being #1 on so many lists (including Rolling Stones’ Top 500 albums and my Top 25 for 1967), it’s still not the best Beatles album. In my book, The White Album claims that title, but Sgt. Pepper’s ... paved the way and deserves a close second. The album completed the bridge between the pop-love fests of Please Please Me and Help! and the exhilarating, experimental sounds the Beatles produced on Revolver and The White Album. No longer a touring act but a cohesive band of mature musicians, composers and lyricists, the Beatles abandoned forever the notion of a carefully rehearsed and recorded, 3 minute and 30 second AM radio song for a free-format assemblage of tracks carefully crafted and spliced together from pieces and sections recorded at different times and (often) different places. Sgt. Pepper’s… opened an artistic freedom and expression that rock music hadn’t seen, and quickly became the standard against which all future concept albums were judged. Unfortunately, its creators lasted only a short three years following the album’s release. The Beatles split up for good in 1970. There are two Beatles playlists in the Playlist Vault. Sgt. Pepper’s… is for purchase as a CD or mp3 downloads on Amazon (but not on iTunes).